Japanese motorcycle manufacturer, Kawasaki has unveiled the new 2016 Kawasaki Ninja ZX-10R at the Tokyo Motor Show 2015. Widely regarded as Kawasaki's answer to Yamaha's stunning R1, the ZX-10R packs in a host of innovative features and trick electronics to get the bike on par with the competition. Kawasaki adds that the new Ninja ZX-10R was developed in joint effort by the Kawasaki factory and the Kawasaki Racing Team. The 2015 World Superbike Championship (WSBK) winning team's star riders, Tom Sykes and Jonathan Rea contributed majorly to the development of Kawasaki's litre class challenger. The company says that it has tried to make the road legal ZX-10R as similar as possible to championship winning race ZX-10R. What's new for 2016 then? Well, the design looks a lot similar to the outgoing motorcycle, which is not a bad thing considering the fact that this Ninja always looked sinister, especially in Kawasaki Green. The design changes are subtle and the new bike sports a larger cowl as well a larger tail section that gets a new lamp. The exhaust is slender and points further up than the unit on the predecessor. Kawasaki has focused majorly on improving the mechanical bits for 2016 and the changes are truly remarkable. The new Kawasaki Ninja ZX-10R gets Brembo M50 monobloc brake callipers along with Brembo idle stroke checked radial master cylinder. The radial master cylinder offers brake force modulability, allowing the rider to adjust braking force to suit the riding conditions. 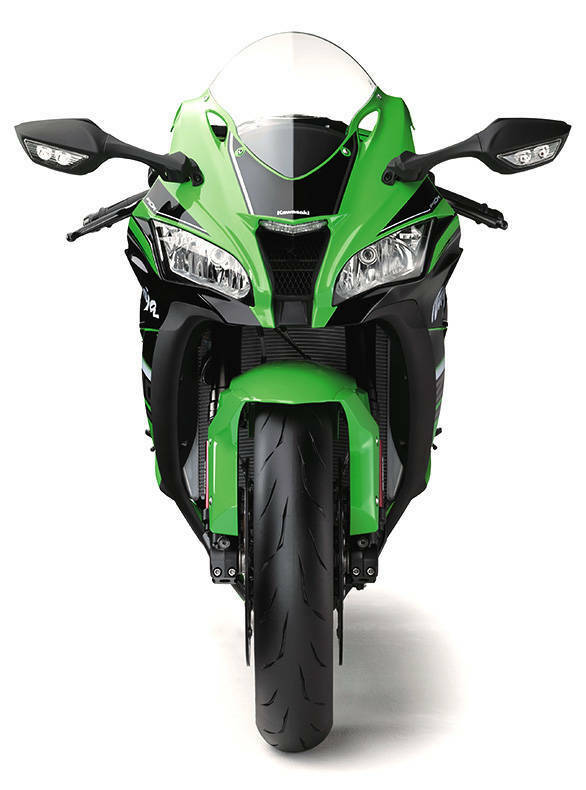 The new ZX-10R also gets a WSBK inspired, adjustable Showa front forks. The electronics package include a six-axis Inertial Measurement Unit, with five axis measurements in the Bosch IMU and the sixth axis using a unique programme that's stored in the Kawasaki ECU. Yamaha has introduced IMU in its R1 for 2015. Besides the IMU, the 2016 Ninja ZX-10R gets launch control, traction control, engine power mode selection and brake management system that allows the rider to brake while hitting the apex. 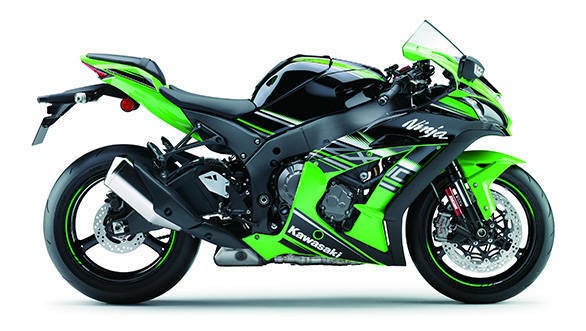 The engine gets a new, lighter crankshaft with 20 per cent less inertia than the engine in the present ZX-10R. 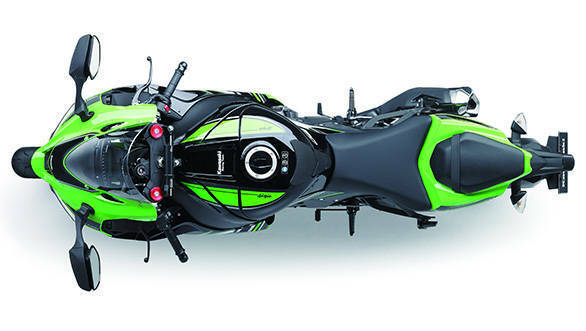 Kawasaki claims a boost in the mid-range without any effect to the 200PS peak power output. The new Ninja ZX-10R is also Euro 4 compliant. 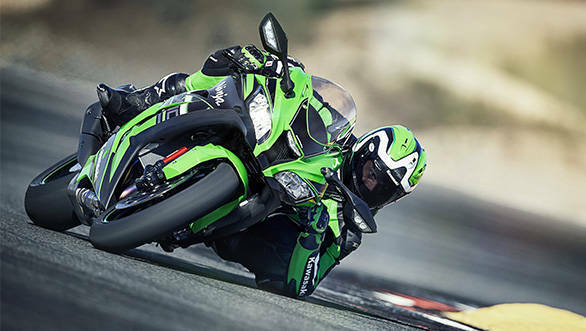 The new Kawasaki Ninja ZX-10R will be available in showrooms from the beginning of 2016. Expect the bike to be launched in India soon thereafter. Giving the latest in the Ninja line its public debut on 8 October in Barcelona, Spain, Kawasaki chose the home town of the Kawasaki Racing Team for good reason. Developed in close cooperation between KRT and Kawasaki factory in Japan, the ZX-10R for the coming year has benefited from the input of two Kawasaki Superbike champions, Jonathan Rea and Tom Sykes. Using the campaign tag line "Get Closer", the winners of the 2015 World Superbike Championship and Manufacturers title are confident the new machine is the closest it is possible for a road going Ninja to be to the machines that have dominated numerous WSBK races and Superpoles in recent years. Featuring a whole host of new innovations in terms of chassis, engine and electronic upgrades, the potential of the new machine as a track day weapon and road riders dream is considerable. Instant visual clues are provided by a cowling with more volume than previous, a wider tail section and other subtle changes. 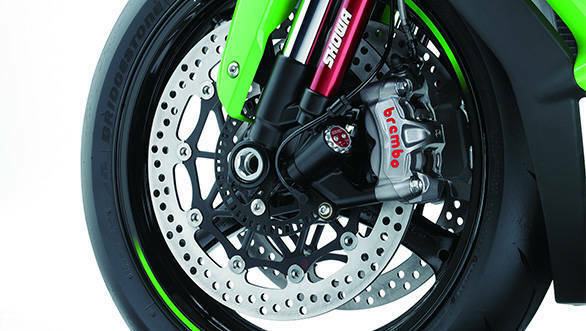 More obvious is the adoption of Brembo M50 monobloc brake calipers, a Brembo idle stroke checked radial pump master cylinder and WSBK style Showa front forks. Created across a prolonged period of testing and development in an exclusive arrangement with KRT, the balance free design of the fork and rear shock for a road bike application is being vaunted by Kawasaki as a major step forward for a customer machine that will be available in showrooms at the start of 2016. A machine which gives up the secrets under its skin willingly, the new Ninja is the first Kawasaki to feature an Inertial Measurement Unit as part of its electronic rider aid package featuring five axis measurements in the Bosch IMU and a sixth measurement using a unique Kawasaki programme stored in the ECU. Combining these the machine is well equipped with advanced traction control, launch control, engine power selection and high precision brake management, the later allowing riders to hit their desired apex on any given corner  even when braking. 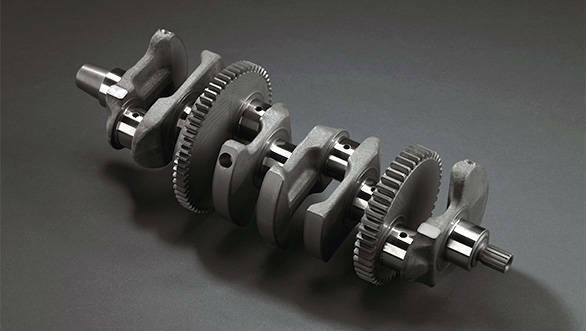 Benefitting from a crankshaft with 20% less inertia than the current model plus numerous other weight savings and upgrades, the 2016 litre class machine exhibits noticeably stronger power in the mid-range without any effect on its 200ps peak power; as well as being Euro4 compliant before many of its rivals. "As a collaboration between the Kawasaki Racing Team and KHI, this is a machine to be proud of", commented project leader for Kawasaki, Yoshimoto Matsuda. "The 2016 Ninja proves that a fast race bike can create a responsive road bike that is easy to ride. Already we have a double championship winning design, now we've refined it further still to reflect Kawasaki's enduring Ninja spirit." Not content with creating the most complete Ninja ZX-10R yet, Kawasaki is encouraging fans to spread the word about the new machine on social networks via platforms such as Twitter with the new hashtag #ninjagetcloser. Check out the official launch video here.